Seth Rogen, Joseph Gordon-Levitt and Anthony Mackie are the three, and in a sense they’re all looking for something on the Eve of the Day. Given that this is essentially a Seth Rogen/Evan Goldberg joint (“Pineapple Express”), there is a lot of raunch as well, like cocaine blood that falls in a drink. But the whole affair has a lightness and casual humor that makes it warmer than expected, and every “movie star” worth their salt wants to have the film that will be pulled out (downloaded? implanted?) every November and December. “The Night Before” just might have the holiday legs for that Christmas Yet to Come. Ethan (Gordon-Levitt), Isaac (Rogen) and Chris (Mackie) are best friends from high school, coming up to age 33 in different ways. But there is one thing they still have in common, every Christmas Eve they get together and go on a epic and traditional night in New York City. One time, they learned of a party called the Nutcracker Ball, but alas over the years they’ve never found it. The gang decides, because of age and obligations, that this “night before” will be their last, and through happenstance Ethan scores three tickets to that elusive Nutcracker Ball. The evening will be consumed in getting there, but first they must score some weed from Mr. Green (Michael Shannon), settle a score with a thief (Ilana Glazer) and hope that Isaac’s pregnant wife Betsy (Jillian Bell) doesn’t go into labor. The night before does have an afterlife. How many films reference both “Wings of Desire” and “Home Alone”? This is a holiday movie that honors the spirit of the season, and approaches its story all from that angle. Some of the gags flop, some of the gags soar, but any movie that has Michael Shannon portraying a virtuous weed dealer scores major points. He is a magical presence, offering tokes of redemption that should have every state in the union legalizing Mr. Green. The casting of the supporting cast is also crystal clear. 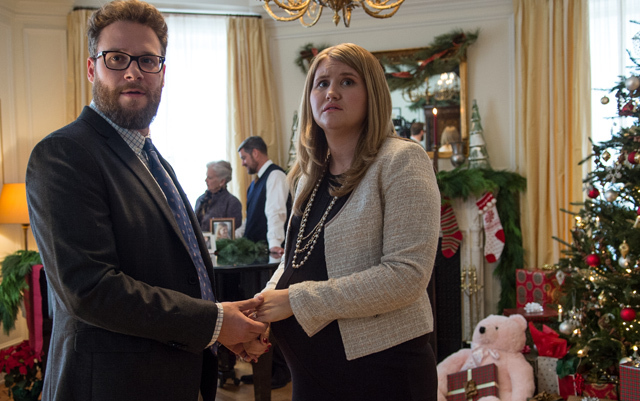 Jillian Bell as Isaac’s accommodating wife – she allows his tradition despite her advance pregnancy – is right up there in raunch and wit as the boys, and keeps that sunny altitude despite the antics (with one notable exception, discussed below). Lorraine Toussaint portrays Anthony Mackie’s mother, with the kind of wise contention that the boy party needed. The always welcome Mindy Kaling brings the raunchiest joke to the table (naturally), and Lizzy Caplan plays “the girlfriend” with a bit more presence and panache than the usual. Plus, are there cameos? Guest stars? Hells, yes, and they’re top drawer! Of the three lead party boys, Seth Rogen surprises, Joseph Gor-Lev is his usual steady self, and Anthony Mackie wants to be in another movie. Rogen does a rant on selfie video that is uncharacteristically weird, another level from him. Gor-Lev has to be the straight man glue to hold everything together, but he knows how to deliver the right energy. Mackie seemed out of place in the film, my feeling was he had some problems on set or wasn’t willing to go to the places the script called for. If there is a sequel in the works (“The Night Before Before”), they’ll need to recast his role. It needed a young Eddie Murphy, not a bland Mackie. 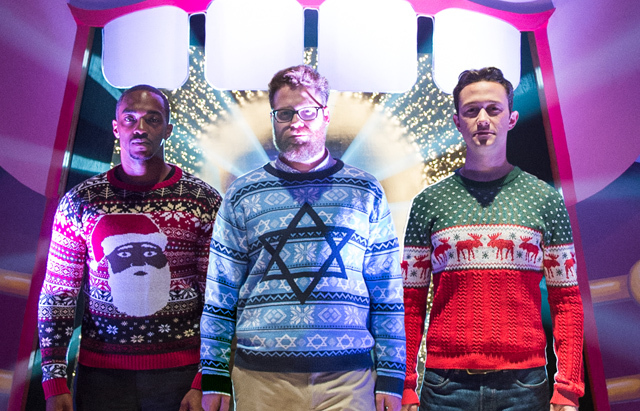 As far as the strangest element in the film, kudos again goes to Seth Rogen for making sure the Jewish voice is heard. He wears a Star of David sweater, he gives props to an Orthodox dinner gathering, and he does a flop sweat in a Catholic Church – although admittedly one of set-ups does score a high concept joke later. Isaac’s wife is supposedly Catholic, and there is a protracted Midnight Mass scene where hubby doesn’t know the ritual (ha-ha), plus the Jillian Bell wife character turns into a shrew. This makes no sense, given that he married a Catholic girl (it was established earlier she was cool), and it rang up as a rant rather than a bit. The scene needed to be excised or rewritten. Regardless, why didn’t the movie use the song “The Night Before”? As it goes – “Were you telling lies…lies/The night before/Love was in your eyes…eyes/The night before…’ The Beatles? Anyone? “Help” soundtrack? Throw me a Mr. Green here. Submitted by Anonymous141 (not verified) on November 21, 2015 - 7:44pm. This is another racist movie where fat ugly Seth Rogen plays an explicitly Jewish character, while good-looking Jewish actors (Joseph Gordon-Levitt and Lizzy Caplan, this time) play non-Jews. As a matter of fact, despite being the son of two Jewish parents, Gordon-Levitt has never explicitly played his own ethnicity once in his entire 30 years of acting. Is there a problem, Joey? This is the same racist trick Rogen pulls every time. He always casts himself as an explicit Jewish character opposite non-Jewish characters played by good-looking Jews (Paul Rudd, James Franco, Dave Franco, Zac Efron, Halston Sage, etc.). And this new film is from the same studio, S.S.ony, that released last year’s Fury, about fighting Nazis during WWII. Fury starred no less than four Jews (Logan Lerman, Jon Bernthal, Jason Isaacs, and Shia LaBeouf), yet none of the characters were Jewish and Jews and the Holocaust were never mentioned. Gee, maybe they should have cast Seth Rogen as a “funny” Jewish soldier who died early on in the film.